Northern Arizona is the home of the Hopi Nation. They chose this remote, high desert land 1,000 – 2,000 years ago, after thousands of years of migration around the Americas. Hopi are descendants of the Puebloan Ancestors of the Colorado Plateau-Verde Valley region going back at least 12,000 years. They continue an ancient tradition that values hard work, respect for life, humility, prayer, cooperation, sharing. They honor life from the birth to the transition of a person into the realm of the ancestors. Every day begins by welcoming Dawa, the Sun, and by giving thanks for life. Hopi people’s prayers and ceremonies are for all peoples and to help maintain balance on Mother Earth. A devout and kind-hearted People, giving and sharing are core values. The Hopis manage to grow corn in the desert without irrigation. Corn is life and proof of their faith, endurance and prayers. In today’s world, Hopi people work to teach the children Hopi language and values. 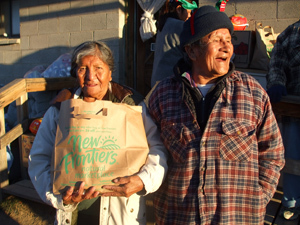 They face economic challenges of living on a remote Indian reservation far from the resources of urban America.